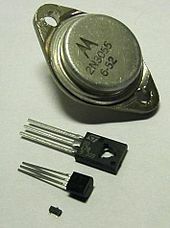 A transistor is a tiny piece of electrical equipment that can either enable or disable the flow of electricity by connecting or disconnecting the ends of two wires. In a transistor, a signal tells the device to either conduct or not conduct (also called insulate). This is an image of different kinds of transistors. Transistors are key to computers because they can either generate electricity (generate a 1) or not generate electricity (generate a 0). A computer chip (also called a microprocessor or CPU) is made up of many, many, many transistors. The more transistors that we can fit into microprocessors the more things that it can do at once, which means faster and better the computers is. In 1965, a guy names Gordon E. Moore, co-founder of Intel, wrote a paper that predicted that over the history of computing hardware, the number of transistors in a circuit doubles approximately every two years. This is now referred to as MOORE's LAW. 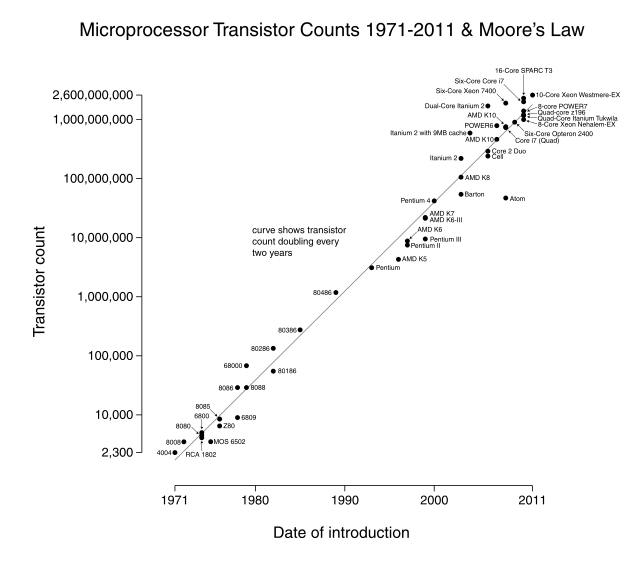 The graph below shows the number of transistors in different chips over the years. Does it look like the number is doubling every two years? Can you find the chip from yor computer? So how is a computer chip, or processor, made? This document outlines how the company intel manufactures their chips. The process is very similar to the one explained in the video. So how does a computer chip, or processor work? Once you have finished watching the videos, download this worksheet and save it. When you have completed the worksheet save it to your computer with your last name in the filename.